Sometimes, terminologies can obscure rather than shed light. Cross-disciplinary projects are the perfect scenario to illustrate this point as to achieve common understanding among all parties involved could be a challenge. Ambiguous understanding is likely to happen when we see a problem situation solely through our own eyes and fail to realise that although other people may be using different words, they are referring to the same concept too. Recently, Carrie, one of my colleagues at Ravensbourne, pointed out this sort of confusing state when she was looking at a new business management strategy. She noted that it was ‘very similar to the iterative design process‘ and emphasised that ‘it’s amazing how so many things are similar but yet have different terminology.’ Similarly, last week this was one of the subjects discussed in class with the MDes students: How do we know what problem-solving process to use? We found a new model everyday! Generally, each discipline names concepts, ideas, models and processes using their own words and terms. Consequently, community members of each discipline tend to build their understanding only using those words and barely look into what peers from other disciplines say or are working on. Current busy lives could be one reason for that, as looking beyond our comfort zone may demand ‘learning’ new perspectives and different set of names. Sometimes having too many terminologies out of context expressing similar ideas could put at risk effective communication and clear understanding. A couple of weeks ago, I attended a lecture about how we manage information and data out there in which ‘terminology’ was highlighted as a barrier to achieve clarity and effective organisation. Van Kleek (2013) explained that the fact that one same object, for example, has many different names constitutes a big problem. A good way to minimise the risk of misunderstanding would be to define words in context, provide real-life examples, anchor words and concepts, and explain the essence of what we mean rather than only its name. Most social and humanist fields argue to have a unique problem-solving strategy. This is the case of the frequently used ‘design thinking’ method (Stanford D.School). Technically, design thinking is a problem-solving or mindset adopted in many business-oriented organisations (e.g. IDEO) to solve current problems, which is based on cycles of five stages: (1) empathy, (2) definition, (3) ideation, (4) prototyping and (5) testing. However, when we look in detail at this process we will see that it is pretty much like any other way of solving problems: based on stages of analysis in which information is explored and broken down into smaller parts, and stages of synthesis in which those parts are recombined as a solution. Looking at problem-solving through the theoretical models of, for example, human information interaction (HII), we will see that those same cyclical stages also occur, but the process is referred to as ‘The Think Loop’ (Pirolli and Card, 2005). Many similar models can be found (e.g. HCI, ID, HCD, etc. ), each of them with different names but roughly all composed of two main stages: seeking and collecting information, and understanding that information and drawing conclusions. Even a non-design related process like ‘How to Make a GF Cake’ could be seen as a problem-solving model based on the stages of seeking, understanding, exploring, prototyping and testing. Of course, each field has specific steps intrinsic to the type of problems that they deal with, but the skeleton is the same. In the above models (i.e. user-centred design, design thinking and baking a cake), understanding the need and defining the problem are the first steps followed by investigating and collecting the necessary ingredients to develop a solution for that problem. Based on that collected information, we can start exploring and creating different alternatives to solve the initial problem. Then we need to test those ideas, and sometimes we have the opportunity to revise initial solutions. Other times we will have to start all over again, e.g bake another cake, but that next time we should take into account the lessons learnt. In other words, everything is context-dependant (to use Cairo’s words). Terminologies are relative and intrinsically related to the context in which they are being applied or discussed. As I highlighted before: Concrete examples and details are a must to facilitate making sense of information. It is important to mention too that one terminology shouldn’t be understood as more reliable or solid than the other just for its origin. This point leads me to another common misunderstanding: we tend to give more credibility to theories, authors, models, ideas belonging to more experienced fields of study than to those coming from more immature or less theoretical domains. To some extent, this is feeding the never-ending academia-practice discussion and widening the gap in between those two approaches to knowledge. Academics and practitioners’ knowledge and experience should not be compared. Their sets of skills should be seen as complementary as they have been trained to look at problems from different perspectives. If well supported, everyone could contribute with a little something (and by ‘well-supported’ I don’t mean a theoretical framework but the rationale behind an idea). Maybe if we all start looking beyond our own bubbles, we could start bridging practice and academia, and being less territorial. Having restless curiosity and starting each day with a beginners mind are steps towards that direction. At the end of the day, all we need is to be able to make sense of what we want to say or do, i.e. to communicate with clarity. 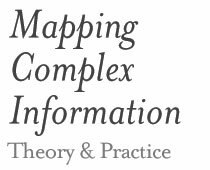 – Van Kleek, M. (2013) Staying Organised … In an Age of Excess (Information) [Lecture] UCL. – Pirolli, P. & Card, S. (2005) The sensemaking process and leverage points for analyst technology as identified through cognitive task analysis. In Proceedings from Proceedings of International Conference on Intelligence Analysis. – Visocky O’Grady, J. & Visocky O’Grady, K. (2008) The information design handbook. Mies: RotoVision.